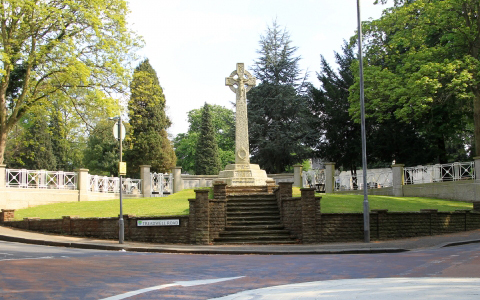 The Epsom War Memorial is located at the junction of Ashley Road and Treadwell Road, in Epsom, Surrey. It is an eighteen feet tall Cornish granite Celtic Cross on a three tier base, accessed via a small flight of steps. 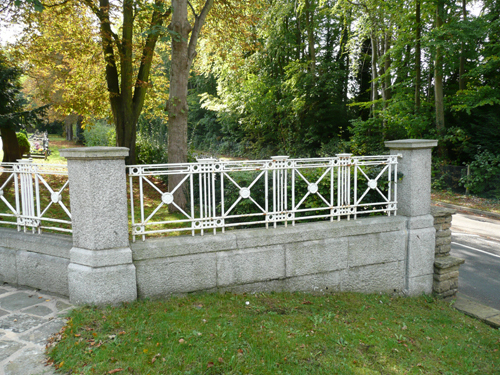 The top tier was inscribed ‘To the Glory of God And’, the second tier ‘To the lasting honour of the men of Epsom who gave their lives in the Great War, 1914-1918′, and the bottom tier ‘Their reward also is with the Lord and the care of them is with the most high.’ The second tier was subsequently amended to include 1939-1945, and the neighbouring town of Ewell. 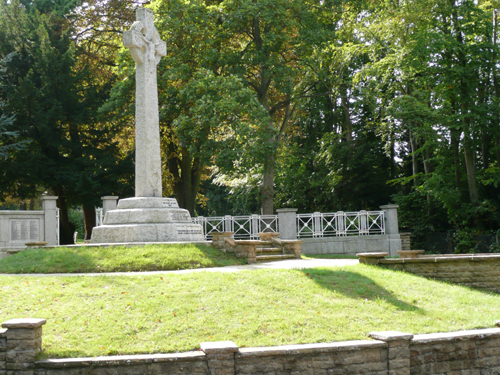 The cross was unveiled on 11th December 1921. After a service of dedication, Mr John Tryton, representing the memorial committee, asked two ex-servicemen, Stoker Petty Officer Arthur Whittington and Company Sergeant Major William John George Dumbrill to unveil the cross, which was draped with a Union Flag. As the flag fell away the Last Post was sounded by buglers, after which the crowd remained silent for two minutes. Prayers were said by the Rev. Bainbridge-Bell, and the hymn For All the Saints Who From Their Labours Rest was sung. Councillor Ede accepted the gift on behalf of the Council. 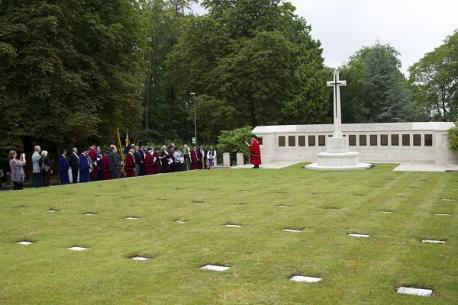 The ceremony was concluded by the playing of the National Anthem, and relatives laying wreaths at the cross. The service started at a 10.45am. Hymns were sung, prayers were spoken and at 11am a two minutes silence was observed. Buglers played the Last Post and then the Reveille. The service concluded with The Lord’s Prayer, followed by the National Anthem. It was not until 3pm that the wall bearing the names of the dead was unveiled. A large congregation formed up at the clock tower and marched to the Ashley Road memorial, and again hymns and prayers were sung and spoken. The wall was unveiled by Major-General Sir Edward Northey, after which many wreaths were laid at the foot of the cross, the Last Post and the Reveille were played and the National Anthem played. 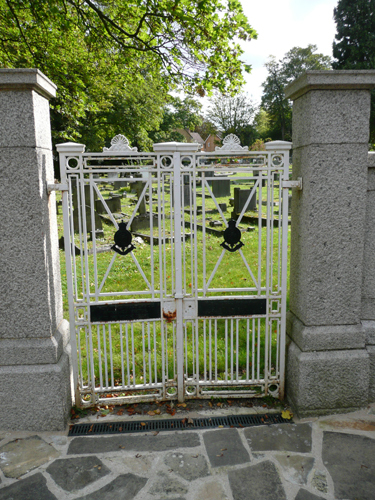 I was asked to examine the railings and gates. 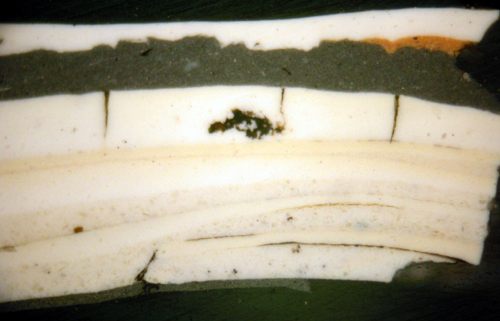 It was interesting to note that all the panels bar one had been stripped at some stage and that information on the original scheme was only visible in a few of the samples (see above). 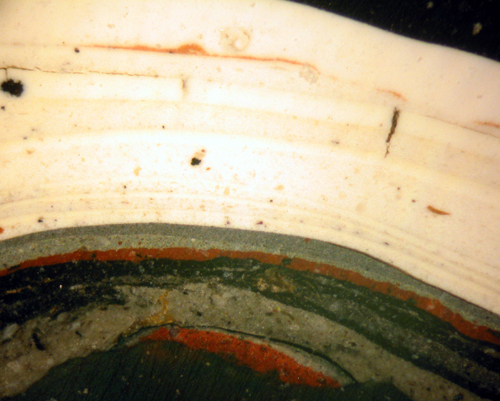 More than anything this demonstrated (yet again) that one can neither make assumptions when sampling nor can one skimp on the samples – every element needs to be examined. It would have been so easy to take half a dozen samples, find that the panels had been stripped and report as much. 1 The 16th (Service) Battalion (Public Schools) was all but wiped out on the first day of the Somme (1st July 1916) suffering 522 casualties – 22 officers and 500 other ranks.